Where the knife meets the board and YOU learn to wield it! A workshop is where the job gets done. A workshop is a place where ideas are born, shared and materialized. We here at Portland’s Culinary Workshop are brimming with excitement to share our knowledge and love of all things edible, good and true. We provide classes for the masses! Stay tuned for our next big culinary adventure! Get your employees out of their offices and engage in a different kind of team building exercise where the most basic human shared experience of making and eating food builds camaraderie. A constant rotating calendar of classes means you will have a never ending flow of new topics to come play and learn from in our workshop. Looking for a fun and unique way to hang out with your friends? Need a cooking class just for your family or friends? Book a private cooking class for at least 6 people and up to 24 at our awesome hands-on cooking school! Please contact us 48 hours prior to class if you need to cancel. You can then transfer into a different class, get a credit for future use, or get a refund. Last minute cancellations will not be eligible for the above accommodations. Thank you for understanding! Learn! Play! 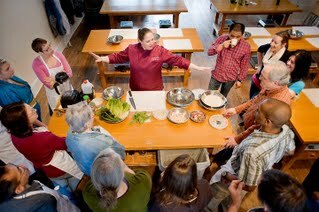 Hone your Skills…feed your love of food at Portland’s Culinary Workshop!